Mobility and ease of travel between destinations is iimportant to everyone. We almost take it for granted; leaving the house to go to college, work, shopping, the cinema, or visiting friends. Sometimes everything is conveniently nearby; at others, not so. Sometimes journeys between various places are easy, at others we need to plan routes to make the journey as easy as possible. But is it the same for everyone? Obviously, not. We are still a long way from living in a world adapted to the necessities of everyone. Below we outline the situation in Spain for disabled travellers in general, particularly regarding public transport and especially the busiest and most popular forms of transport. Discapacitado. Viajar tren. AndaluciaIn 1989, Spain’s national train network, RENFE, the Red Nacional de Ferrocarriles Españoles (commonly and usefully known by the phonetic ‘Renfie’), reached agreement with a royal commission on disabled travel, and in 1993 another with IMSERSO, a state organisation dedicated to special needs travel, to improve disabled access to the rail network. Accordingly, all new stations are now constructed to maximise disabled access. The stations of the new high-speed inter-city AVE service, for example, are all accessible by the mobility-impaired. At the same time, works continue to alter existing and older stations to improve disabled mobility when arriving at a station, buying tickets, platform access, boarding and leaving trains, access inside train carriages and exits from destinations. - Clearly marked disabled-only parking spaces at stations. - Automatic doors on ticket halls. - A cyber-guide for the variously disabled to provide spoken information and access to personal traveller assistance at stations; -Ticket windows with speaker systems to assist those with hearing difficulties and announcement systems suited to those using hearing aids; Lifts, raised platforms and folding ramps, or mobile ramps, to improve access to train carriages. - For the blind and sight-impaired, platforms have been fitted with easily recognisable raised floor markings setting out where it is safe to wait for trains. The high-speed AVE train service is adapted for disabled access on and off the trains. The Santa Justa RENFE terminus in Seville won the Helios de Accessibilidad award in 1991, in time for the 1992 Expo. The AVE station in Córdoba is also generally accessible for those using wheelchairs, and there are other facilities for those travelling with reduced mobility. The Portollano station is accessible throughout to wheelchair users or with other disabilities, as at the station of Cuidad Real. Finally, at Madrid’s Puerte de Atocha station, Spain’s hub for long-distance and high-speed trains, there are the same disabled facilities as at the AVE high-speed train stations. In these five stations there is also an office offering personal attention to those with impaired mobility, where disabled travellers can obtain assistance with any problems they may encounter. In Madrid’s other main terminus, Chamartín, there are ten hydraulic lifts fitted to serve disabled traveller needs, and there are also four lifts for the disabled at the Príncipe Pío station. RENFE has furthermore made structural changes to ease disabled access at the following stations: Albacete, Badajoz, Barcelona (Sants), Cádiz, Gerona, León, Lorca (Murcia), Málaga, Madrid (Chamartín), Murcia, Oviedo, Palencia, Pontevedra, Santiago de Compostela (La Coruña), San Sebastián, Tudela (Navarra), Valladolid, Vitoria and Zaragoza. The El Portillo station is the latest destination to offer special services to disabled travellers. RENFE has also raised the level of disabled access at stations on its local train networks, and where necessary it has altered platforms to ease access to train carriages. This work is now believed to have been 100 per cent completed on its networks around Madrid, Barcelona, Seville, Málaga and Asturias, followed by an estimated 85 per cent completion of works throughout the rest of the networks. Important note: If you have any queries or want to find out about disabled access at any station, call the information line Teléfono de Información y Asistencia al Viajero (902 24 02 02) signposted at every station. New European regulations prohibit airlines from refusing access or discriminating against passengers in any way on grounds of disability. Even so, there still may be situations that may work against the disabled traveller, if the aeroplane is too small, or if it cannot comply with all the traveller’s needs. However, the disabled traveller has the right to require the airline to provide an alternative flight or return the price of their ticket. It is also a duty of airports to provide help to travellers with mobility difficulties and any disability, physical or psychological, and this assistance must be offered free by the airport and by the airline once the passenger is aboard the aeroplane. It is useful for both passengers and service providers for disabled travellers to explain in advance just what assistance they will need for their journey, and from whom. Equally, many problems can be avoided by booking through a travel agency, who should be aware of travel conditions and can help book special requirements in advance. In whatever circumstance, even if travellers have not warned of their needs in advance, it is a requirement that airports provide all possible assistance to disabled travellers. Normally, travellers needing special attention find that their biggest problem is getting on and off aircraft. Again, passengers with mobility difficulties can ask to be assigned seats with moveable arm rests in the first row at the front of the aeroplane, as these have more leg room. Discapacitado AndaluciaTravellers with mobility difficulties have priority in travelling with items such as folding wheelchairs, crutches, walking sticks, walking frames and any other equipment they need to get around. If you will need a fixed wheelchair to travel it’s necessary to explain this when making a reservation. This will almost automatically have to travel in the baggage hold. Sometimes it’s possible to fit a folding wheelchair in crew space onboard. If one additional piece of luggage is tagged with an identification card, it will be carried without extra cost. 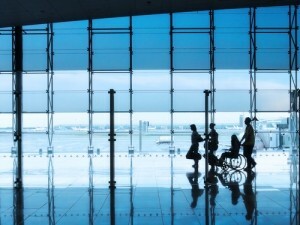 Airport staff will assist wheelchair users when boarding and disembarking, advise on waiting time for boarding and arrange transport to the boarding gate, aircraft doorway or by specially adapted indoor transporters such as buggies. Once aboard, if you cannot take your own wheelchair the airline will offer a (much narrower) wheelchair to get you to your seat. Aircraft crew will also assist with any special requirements. It is also important that the airline advises ahead that airline staff should meet an arriving disabled traveller. Before your flight begins its descent, it is always useful to ask cabin crew if a wheelchair carried in hold luggage will be ready when you arrive. For this reason, disabled travellers are usually the last to be asked to leave the aircraft. According to Spanish port authorities, modernisation and rebuilding projects have seen the installation of disabled access features in the ports of Algeciras, Cádiz, Ceuta, Gijón, Las Palmas, Marín-Pontevedra and Santa Cruz de Tenerife.On its own initiative, the Compañía Trasmediterránea, the biggest ferry operator in Spain, has said that it plans to install disabled facilities in its new ferry terminals in Barcelona and at Las Palmas on Gran Canaria. Regarding the ferries themselves, the five latest ships launched by Trasmediterránea have incorporated design improvements, such as specially adapted cabins and disabled bathroom facilities. Lifts are available, and interior doorways are free of hatch-style doors that made older craft difficult to negotiate. Ships on Fast-Ferry routes have seats adapted for disabled users, access ramps and bathrooms with facilities for the disabled. 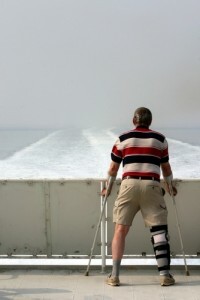 All ferries have at least one or two wheelchairs for disabled passenger use, as do the ports serving high speed ferries. Passenger information leaflets provided by Transmediterránea also contain specific details about facilities and access on each of their ferries. Wherever and whenever you travel, it’s important to have acessibility in the departing and arriving bus stations, on the particular bus you’re on, and wherever it stops. Similarly, on routes or regular local services, the facilities for and on stopping services. 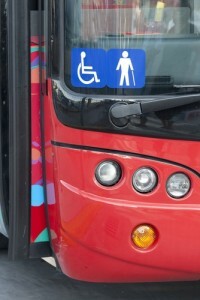 Generally, bus stations have only limited disabled access or facilities, such as entry ramps to the stations themselves, or disabled bathrooms. Parts of service areas on major motorways have elementary access facilities. Even here, though, there are certain notable exceptions, thanks to an agreement between Spain’s motorway service providers Autopistas Concesionarias S.A. and the national disability charity, ONCE (‘Onsay’, eleven, of the ubiquitous green street lottery kiosks). In terms of the vehicles themselves, few transport companies have chosen to adapt their fleets to serve travellers with reduced mobility and other disabilities. Discapacitado bus. andaluciaIn most Spanish cities, bus stops still lack any facilities for disabled travellers, even when integrated travel systems attempt to include adequate services for those with reduced mobility. In the bus fleets, buses with second or higher decks with stairways with handrails are the norm in most cities. Consequently, these are inaccessible to the disabled and those using wheelchairs. Raised or rising platforms are rare; it’s more common to find facilities for those with walking difficulties or sight or hearing impairment. The major improvement for disabled travellers has been the appearance in the past ten years or so of low-level buses, signed ‘autobuses de piso bajo’, in almost all Spanish cities and towns. However, the widescale renovation of the bus fleets with low-level buses did not meet all the needs of disabled travellers, but to improve the running of the bus services would be to install low-level buses with retractable ramps to aid getting on and off. In reality, there is a great uneveness or disparity in services offered to disabled travellers in Spain. In most areas, they simply do not exist. Acostumbro cada noche buscar posts para pasar un buen momento leyendo y de esta forma he encontrado vuestro articulo. La verdad me ha gustado el post y pienso volver para seguir pasando buenos ratos. This really is NOT ACCEPTABLE!! Are we not in 2018? And I can’t leave my home because there are no buses to cater for a wheelchair? Why has the EU not done anything about this? I’m ANGRY & upset that I can’t live my life as an able bodied citizen & am regarded as SECOND CLASS!